We are an established eavestrough repairing company serving the citizens of Etobicoke for more than ten years. We make sure that your gutters are working in a perfect condition by offering a wide range of services varying from cleaning to seam repair. Whatever the problem is, our experts will provide you a quick and cheap solution. 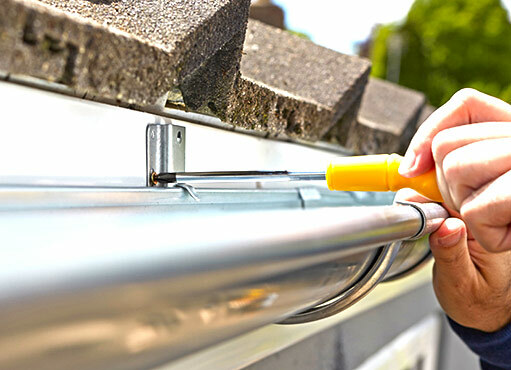 We are the most trusted gutter repairing company in Etobicoke and have earned this status by tireless efforts of our well trained and friendly professionals. Every member of our team has gone through extensive training to polish their skills. We have an established framework secured by full liability insurance and our every employee enjoys WSIB coverage. Gutters fail due to many reasons such as faulty installation or poor-quality materials. Each reason causes a different type of failure. For example, poor quality material will corrode easily causing wear and tear of surfaces ultimately leading to loosening of joints. Seam leakage or joint leakage is the most common type of failure which may occur due to variety of reasons. It occurs when sealing compound, which holds the seams in place, deteriorates. However, its treatment is quite easy and can be done by mending the joints of the affected gutter sections. Our experts are highly experienced in seam repair and restoration. It is, in fact, the most efficient and quickest way of solving all kinds of leakage-related problems like flooding or moisture accumulation in various parts of building. 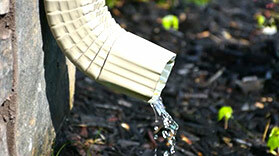 Your gutter system will work at its full capacity only by proper maintenance. It will also enhance the lifespan of your drainage system. Many people do not pay attention to small problems in their gutters unless they become unavoidable. Regular maintenance can save you a lot of money because a stitch in time saves nine. One common problem that many people avoid to repair is the sagging of gutters. It can be caused by a variety of reasons such as overlaying weights of trash, leaves etc. and leads to loosening of joints. We provide routine inspection and regular maintenance services for dealing with sagging and similar problems. We advise you to get your gutters checked at least two times a year. Gutters of large facilities like residential settlements or plazas bears a lot of load as compared to ordinary gutters and are more likely to fail in extreme weather conditions. They require more frequent repairing than the normal house gutters. They become overweighed due to fallen leaves in autumn, as they have greater surface area. We provide all sorts of cleaning and repairing services of gutters of such large facilities throughout Etobicoke. Regular inspection can save you a great deal of trouble and money, too. Contact us to find about the services needed for your commercial gutter. We are the best gutter repairing company in all of Etobicoke. We offer you the most affordable rates along with exceptional quality of work. We have the quickest service providing time. But the main thing which distinguishes us from other companies is our customer service. We value our customers. We strive to achieve customer satisfaction in all our works. Our experts work in safe manner and do not leave any sort of mess after work. We respect our customers and their valuable properties. We also provide a free-of-cost estimate of the work to be done beforehand. Gutter and downspout is an important part of a building. If proper maintenance is not carried out then many severe problems like moisture accumulation and flooding can occur. To enjoy your property, your gutters should be in a perfect condition. Many people try to save their money and repair their gutters without consulting any professional. Please do not act by yourself or else you will probably end up creating more problems. So, hire a professional who can do this work for you. Regular maintenance will save you a lot of money. You should never try to repair gutters by yourself because it is a very dangerous task for someone with no knowledge in this area. That is why you should hire experienced industry professionals who have the right resources for this task. You and your property are at a great risk if you try this without proper equipment and resources. At NICK’S Window Cleaning, we provide all kinds of gutter repair and cleaning services. Our team is highly experienced in providing inspection, restoration, and cleaning services. We excel in all our services, from locating failures to mending joints and broken ferrules, we do everything perfectly. We restore your drainage system to its original condition. We provide all drainage-related services like soffit repairs, corner leakages, leaking gutters, sagging gutters, overflowing gutters, blocked downspouts, leaking downspouts, patching eavestrough holes and much more. We do everything! Our work is the best! We have been serving Etobicoke for more than a decade. We have all the resources needed for all kinds of drainage-related services. We have the latest tools, ladders and associated equipment to carry out our work without damaging your property. We own a well-trained team of talented professionals. Our workers have got WSIB coverage and our company is secured by full liability insurance. We offer the best quality work in the most affordable rates. Our work is the best!